Provide comfort for the family of Roswell Allen with a meaningful gesture of sympathy. 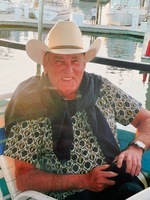 Roswell “Ross” Allen, 81, of Litchfield, NH, died peacefully at his home on February 16, 2019 with his family at his side. He was born in Grafton, NH on November 24, 1937, a son of the late Roswell and Vera (Taisey) Allen. Mr. Allen was the husband of Ada (Price) Allen, whom he married on January 17, 1964. They have shared over 55 years of marriage. He is remembered for his love of music, both playing and listening. He was an avid reader. He enjoyed cooking and traveling throughout the United States. Ross also enjoyed betting on horse racing, as well as riding horses. He was also known for always having a Stetson cowboy hat. Besides he beloved and devoted wife, Ada, he is survived by his children, Randy Allen and his wife Diane Balboni of Hudson; his daughter, Pamela Stanhope and her husband Mike of Litchfield; his four grandchildren, Amanda Canada of Hudson, Jonathan Allen of Nashua, Rachel Stanhope Anchorage, AK and Kevin Stanhope of Litchfield; and his sister, Inez Gingras of Pelham. SERVICES: A Graveside Funeral Service will be held at Montefiore Cemetery, 46 Pulpit Rock Rd., Pelham, NH on Sunday, February 17, 2019 at 11:00 AM. His family will be receiving friends and family at his home beginning Sunday afternoon at 1:00 PM through Tuesday evening until 7:00 PM. In lieu of flowers, those planning an expression of sympathy are asked to consider a memorial donation to the Aaron Cutler Memorial Library, 269 Charles Bancroft Hwy, Litchfield, NH 03052, Manchester VNA, 1070 Holt Ave, Suite 1400, Manchester, NH 03109 or the Horse Rescue NH, Hidden Pond Farm, 250 So. Road, Brentwood, NH 03833. To send flowers in memory of Roswell "Ross" Allen, please visit our Heartfelt Sympathies Store. We encourage you to share your most beloved memories of Roswell here, so that the family and other loved ones can always see it. You can upload cherished photographs, or share your favorite stories, and can even comment on those shared by others. Provide comfort for the family of Roswell "Ross" Allen by sending flowers. Ross was one of my favorite patients. Sweet and soft-spoken, he was a true gentleman and a man I will not soon forget. May he rest in peace. Words cannot describe our sadness and offer our heartfelt sympathy for the Allen family. Ross was just a gentle man and loved his family deeply. He will be forever missed. RIP Ross, the suffering is finally over.